Wow! A few have you have sent me a link to an awesome illusion! I absolutely have to share this ambiguous cylinder illusion with all of you! Check out the objects below. In real life, they appear to be groups of square shaped tubes. However, when placed in front of a mirror, they appear to be cylinders! The one on the left in this picture even appears to be a series of interlocking cylinders! 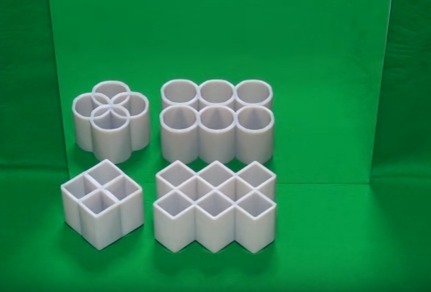 If you think this ambiguous cylinder illusion is just a clever Photoshop job, you would be wrong. It’s definitely very real, and there’s video evidence to support it! It was even a finalist for the Best Illusion of the Year Contest in 2016! At this point, I’ll bet you’re wondering how it’s done. I know I was, so I did a little digging. You can check out this neat little video to reveal the secret! If you loved this ambiguous cylinder illusion as much as I did, make sure you rate it with the stars below and share it with your friends! Next Who Wants Some Color Changing Cake?